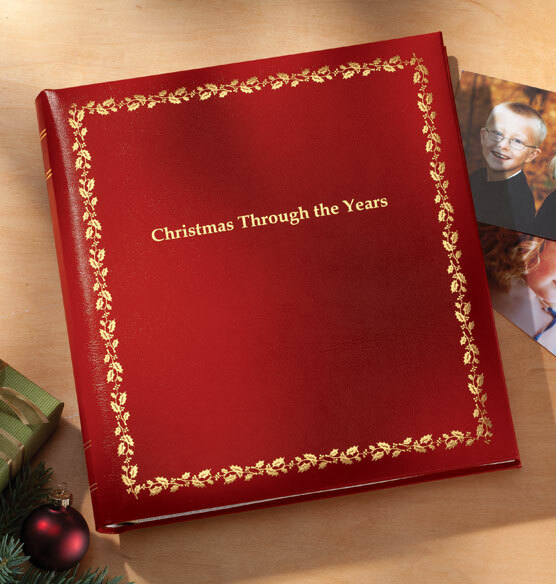 Cherished memories are lovingly preserved with our luxurious gold foil stamped red leather Christmas keepsake photo album. Wrapped and lined in ivory bengaline, three sturdy rings hold up to 30 photo pages. I want to put all of our christmas cards from years past (and future) into an album. I bought one years ago and it is full. Need a volume 2! This item matches a Christmas memory book I have. I bought this to capture our family's Christmas memories each year. I wish this item could be personalized. I have one of these and wanted one for my granddaughter. I enjoy looking at my album every year. This is the third album I have bought and it's great to look back on Christmas memories through the years! I have been using the Christmas albums from Exposures for 17 years! First style no longer available and have been using the current style. LOVE it!!! Wish there were more sheets for photos storage inside available. Lovely to be able to go right to a Christmas album and enjoy the memories so easily!! to put all of the Christmas photos in order through the year. Need another book with growing family! To create display of yearly Christmas photos. The color and title are perfect. I have been looking for a xmas album like this for a long time. This is my second Christmas album. The first is bulding full of memories! This will be my third book that I have ordered. It is always a family tradition to review photos from past Christmas's when the family is together. These books are attractive and well made. I put them out on my coffee tables to be enjoyed each Christmas! Perfect for my family Christmas Book! Families should have their own albums for just Christmas memories. I have one and it is full. Need to start the second one. We have this same album personalized & dating back to 2003, and love it! Finally filled up & looking to continue adding memories. Wish this version had a personalization option but quality & weight so wonderful so we’re thrilled to purchase again!! Matching high quality previously purchased album. For my Christmas memories in one place. This is the perfect album to hold annual our Christmas cards and Christmas highlight photos! This finally became available again. Great workmanship, so classy! This is a great album to store holiday pictures and share with family! I wanted a place for my Son and Daughter In-law to keep their children's pictures with Santa Claus and annual photo Christmas cards as a remembrance of years past. I wished I had done something like this when my kids were little. In this time, we NEED to print out our memories. Photos are a treasure for generations to come. Print them, people!!! I have one and love it. I ordered them for my newly engaged nephews and newly married goddaughter. Can the "Christmas Through the Years" photo album be personalized with a family name? BEST ANSWER: Thank you for your question. Unfortunately no, this album can not be personalized nor can the preprinted phrase be changed. We hope this information will be of help to you. How many pages/pictures does it hold? BEST ANSWER: Thank you for your question. This album Holds up to 30 3-ring double weight photo pages (3 sets). The number of photos would be determined by the style of photo page you choose. We hope this information will be of help to you. This album was given to my family for Christmas in 2008. It came with 10 cardstock blank pages separated by beautiful vellum type protector pages. I have enjoyed scrapbooking a few pages from every year. But I am now out of pages and I have three years to catch up! Which refill may I order? I DON"T want the pocket refill pages as I enjoy creating a handmade looking with scrapbook materials. BEST ANSWER: Thank you for your question. Since pages are purchased separately, we are unsure as to which page you had in the past, however, we are including two links to our designer pages that we have available. We hope this information will be of help to you. Does this not come with an option to personalize? BEST ANSWER: Thank you for your question. Unfortunately no, we do not personalize this item. We hope this information will be of help to you. I enjoy bring the album out yearly. My children and Grandchildren are excited to look back on the years!! What are the dimensions of the alburm? I am trying to match an existing collection consisting of albums approx. 9" X 9". Do you have any other 3-ring albums which are approx. 9" X 9"? BEST ANSWER: Thank you for your question. The album measurements are 11 1/2” wide x 10 1/2” high x 2 1/8” deep. We hope this information will be of help to you. So, do you have any 3-ring albums which are approx. 9" X 9"? (Charter album, for example). Are the pages like baseball card pages with pre-determined sizes, or is it just overlay over an 8 /12 x 11 paper? BEST ANSWER: The pages are like baseball card pages with pre-determined sizes. The album is beautiful. I ordered extra photo pages to accommodate our numerous Christmas photos. The pages are clear plastic like a baseball card page. I was disappointed in that. I would have preferred the acid free paper pages with tissue in between. I purchased this years ago and have run out of the black insert pages to put more Xmas cards in. I asked about order some replacement sheets but they came and were the wrong size. Are there black 3 ring insert pages measuring 13" by 12.5" to add more pages to my album? BEST ANSWER: Thank you for your question. Unfortunately we do not carry that size of pages. We hope this information will be of help to you. Any place to date and write about each photo? BEST ANSWER: Thank you for your question. Pages are sold separately. It will depend on what photo pages you use for the album. We hope this information will be of help to you. would this hold 8 1/2 x 11 pages? BEST ANSWER: Thank you for your question. The measurements are 11 1/2" H x 10 1/2" W x 2" D. We hope this information will be of help to you. what sheets from your site can I use inside for photo storage? BEST ANSWER: Thank you for your question. Any of our three ring pages can work for this album. We hope this information will be of help to you. Do these fit 8X10 photo pages? BEST ANSWER: Thank you for your question. The album will fit 8x10 photo pages that measure about 9 1/8" x 10 3/8". We hope this information will be of help to you.